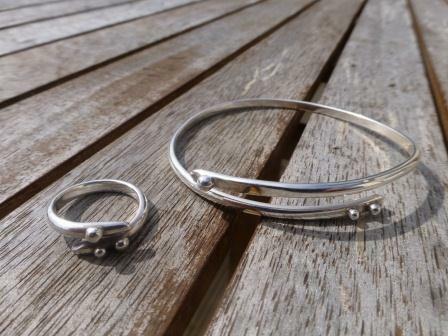 Wrap-around stylish handmade bangle with 3 silver nuggets. The nuggets are formed by heating silver to a very high temperature, which is known as granulation. The bangle is then polished to a high shine. It is hallmarked by the London Assay Office and also includes my sponsors mark. This price is for the bangle only, although a ring in the same design is available and an additional cost. This design is also available with nuggets in white, yellow and rose gold at an additional cost.